Spend £50 or more and get 2x 1 Feminized seed(s) of Baked Alaska by High Altitude Seed House added onto your order for free. Spend £90 or more and get 2x 1 Feminized seed(s) of Hairy Lemon by High Altitude Seed House added onto your order for free. 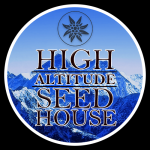 Spend £120 or more and get 2x 1 Feminized seed(s) of CBD Critical Mass by High Altitude Seed House added onto your order for free. Spend £150 or more and get 2x 1 Feminized seed(s) of Killermanjaro by High Altitude Seed House added onto your order for free.